This is the competition page for Eisch red wine glasses offered by Fine Wine magazine. Winner announced - visit here. We are giving away a box of 6 beautiful Eisch red wine glasses to the lucky person who correctly selects the correct answer to the questions below. 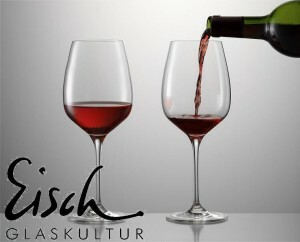 Eisch glasses represent the pinnacle of glass manufacture in both their beauty and use. A wine poured into one of these glasses just 2-4 minutes before will show signs of aeration equivalent to the same wine that has been decanted and aerated for 1-2 hours. This natural process takes place within the wine itself, in just minutes. The original character and structure of the wine are preserved, yet the wine's aroma and its impression on the palate appears more and more generous. These benefits can also be transmitted to spirits, fruit juices and mineral water. The glasses are made from lead-free crystal glass. After their manufacture, they undergo a process which gives them the unique properties described above. Each glass is marked with a sand-blasting mark (a wave) on the base of the glass. All the glasses are dishwasher proof and require no special cleaning. 1. The competition is open to any person, anywhere in the world, who correctly answers the question above and in the view of the judges best expresses why they wish to win a set of Eisch red wine glasses. 2. Family members, trade partners and affiliates are expressly excluded from (1) above. The Publisher will have the final say in this matter. 3. You must be over the age of 18 to enter. 4. The competition closes on 30 November, 2012. 5. The opinion of the Publisher is final. 6. No correspondence can be entered into on any matters arising from any Competition. 7. Unless specifically stated otherwise, prizes are not transferable and no cash alternative to prizes will be offered. 8. Only one entry per person is permitted. 9. Names of winners and results of Competitions will be available on this website. 10. The Publisher reserves the right to change the rules applicable to any Competition or to void any Competition at any time and for any reason. 11. No responsibility or liability will be accepted for entries which are not received or are lost in transmission for any reason.